Stars Ethan Hawke, January Jones and Zoë Kravitz reveal what it's like to work with writer-director Andrew Niccol in our exclusive preview for Good Kill. This drone thriller is available on Digital HD starting today, ahead of its Blu-ray and DVD release on September 1. The will film also be available for sale or rental from cable, satellite and telco providers through its theatrical distributor, IFC Films. Hailed as "exhilaratingly of the moment" (Guy Lodge, Variety), the compelling thriller Good Kill comes from the producers of The Hurt Locker and writer/director Andrew Niccol (Gattaca, Lord of War). Good Kill features Ethan Hawke's "best screen role in years" (David Rooney, The Hollywood Reporter) as a drone operator in 21st century warfare, where combat unfolds like a video game, but with real lives at stake. Veteran Air Force pilot Tom Egan (Hawke) yearns to get back into the cockpit of a plane, but now he launches drone strikes from an air-conditioned box in the Las Vegas desert. When he starts taking orders directly from the CIA, the stakes are raised and Egan's nerves - and his relationship with his wife (January Jones, Mad Men) - begin to unravel. The supporting cast also includes Bruce Greenwood, Jake Abel, Ryan Montano, Dylan Kenin, Stafford Douglas, Fatima El Bahraquy, El Khttabi Abdelouahab and Zion Rain Leyba. The Good Kill Blu-ray includes a behind-the-scenes look at the making of this "fascinating" (Ian Freer, Empire) film about the rarely seen world of drone strikes, where operatives target enemies from half a world away. 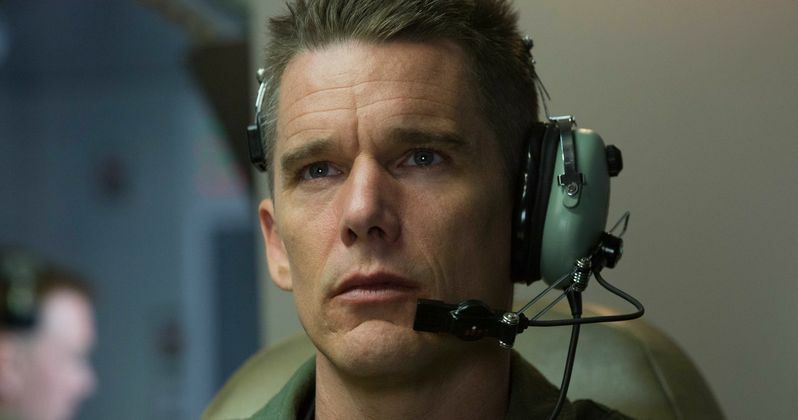 Good Kill marks the third time that Ethan Hawke has teamed up with filmmaker Andrew Niccol, following the 1997 sci-fi drama Gattaca, the filmmaker's directorial debut, and 2005's arms dealing drama Lord of War. The actor reveals in our exclusive preview that Andrew Niccol is one of the best writers in the business. January Jones and Zoë Kravitz, who both worked with Andrew Niccol for the first time on Good Kill, reveal how they both trusted the filmmaker on the set. Good Kill didn't make any noise at the box office when it arrived in theaters this May, earning just $316,472 during its theatrical release. It was only released in 143 theaters across the country, so there are many who didn't even get a chance to see it in their local theaters. Check out our exclusive preview for Good Kill before checking it out on Digital HD this weekend.